The Great Depression was an awful time for farmers in Iowa. It culminated with the near hanging of a judge in Le Mars. It just happens that the farm involved was owned by the T.M. Zink estate, the same man who left his savings for the establishment of a womanless library. Today I present to you the second in my three-part series on Le Mars, Iowa. In the last podcast I told you about Le Mars lawyer T.M. Zink and his desire to have a womanless library constructed seventy-five years after his death. 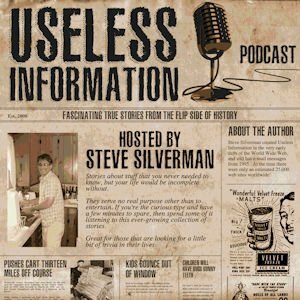 If you haven’t heard the story yet, I encourage you to listen to that episode first. The events of today’s story may never have happened if Zink had written a more typical will. For most people the Great Depression begins with the stock market crash on October 24, 1929. Yet, for the rural farmers of the midwestern United States, their depression began shortly after the end of World War I. Up until this point, farmers were enjoying ever-growing production and profits. Greater profits allowed them to purchase more acreage and equipment, which also meant taking on more debt. As with most financial bubbles, the farmers were headed for a crash. They were suddenly hit with a triple whammy: to run efficient farms expensive machinery was needed. But mechanization created overproduction, which, in turn, leads to sudden price deflation. While industry could simply lay off workers and idle manufacturing plants, farmers lacked a similar option. Farm employees were family members, not hired hands. Livestock still required food and care and idle land meant no money to continue paying the hefty farm loans. Farmers were already suffering badly when Black Tuesday hit. Prices for produce and meat suddenly plummeted and farmers could no longer afford to pay their bills. 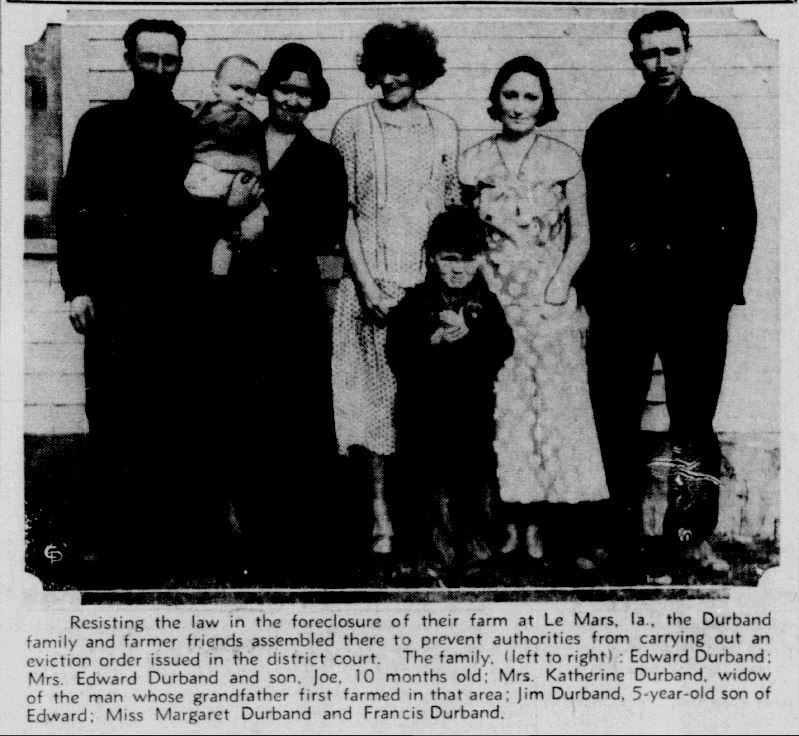 Perhaps no other family portrayed this farming crisis better than the family of Edward Durband, Sr. His farm was located in Struble, Iowa, which is just a short distance north of Le Mars. When Ed died on November 20, 1932, no one could have ever imagined that his farm, or at least what was left of it, would put Le Mars right back on the front page of newspapers across the country, just two years after that bizarre request for a womanless library did the same. Before I tell you why Le Mars was once again thrust into the spotlight, I should probably back up a bit and tell you more about Ed Durband. He first came to Struble in the 1880’s and operated a grocery store and implement shop. He gained great wealth as a savvy businessmen and soon started buying and selling farmland. As for that land bubble prior to the end of World War I, Ed got caught up in it in a very big way. Along with partner William Nicholson, in 1919 the two landed one of the county’s largest land deals up to that point. 1,600 acres was purchased for $375/acre for a grand total of $600,000. Adjusted for inflation, that’s about an $8-½ million investment. Very quickly things started going sour. Durband sold about 620 acres of the land to a guy named John Ney for $415/acre, which would have been a profit of $24,800 or $350,000 adjusted for inflation. But it was never to be. Ney reneged on the deal, one can only guess due to the sudden plummet in land prices following the war, and the whole ordeal ended up in court. Durband was in need of a good lawyer. Hmm… Let’s think about this. Who could he hire in Le Mars, Iowa? Any suggestions? You guessed it. He hired misogynist attorney T.M. Zink. This image of T.M. 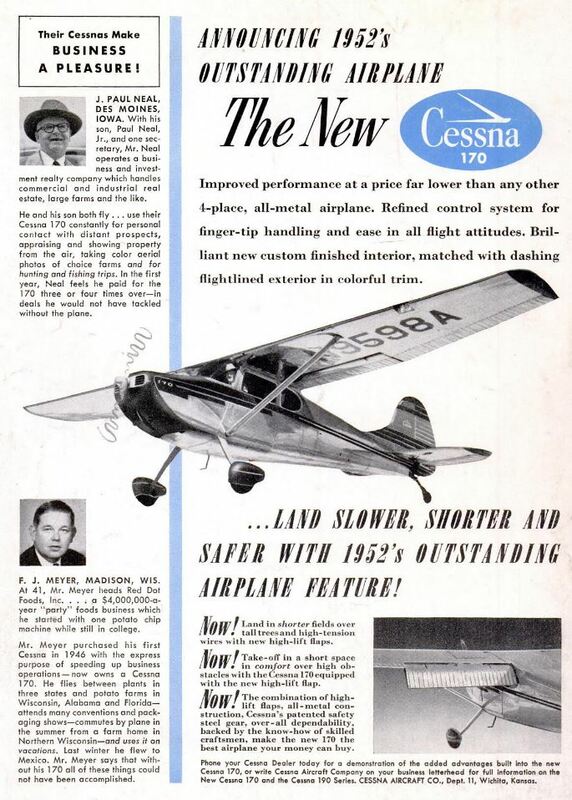 Zink was used in many of the articles that appeared in the press around the country. From the November 23, 1930 issue of the Arizona Daily Star. Well, he should have found a better lawyer. They lost and the case was appealed. In 1923 the state Supreme Court ruled against Ney and awarded Ed Durband $34,382.80 plus interest. At first glance, it would seem like Ed Durband was now sitting pretty. Not only did he still own the land, but the court had awarded him more money than he would have originally seen in profit had the deal gone through. But that was not how it played out. Durband owed the Northern Trust Company $171,049.86 and the bubble had burst. There was no one sell all that land to. In 1924, the court declared that he was in default of the loan and Durband lost the land. Things only went downhill from there. Desperate for money, Ed Durband was forced to mortgage 480 acres of his 640-acre farm. That didn’t work. He soon lost it all. The last 160 acres, which included the family home, was placed into receivership and sold in a sheriff’s sale on the Le Mars courthouse steps. The buyer? None other than lawyer T.M. Zink. Whether Zink purchased the Durband farm to help an old friend or just to make a profit is anyone’s guess. The one thing that is certain was that Ed Durband no longer owned the land and now had to pay T.M. Zink rent to continue operating his own farm. You already know what happened next. T.M. 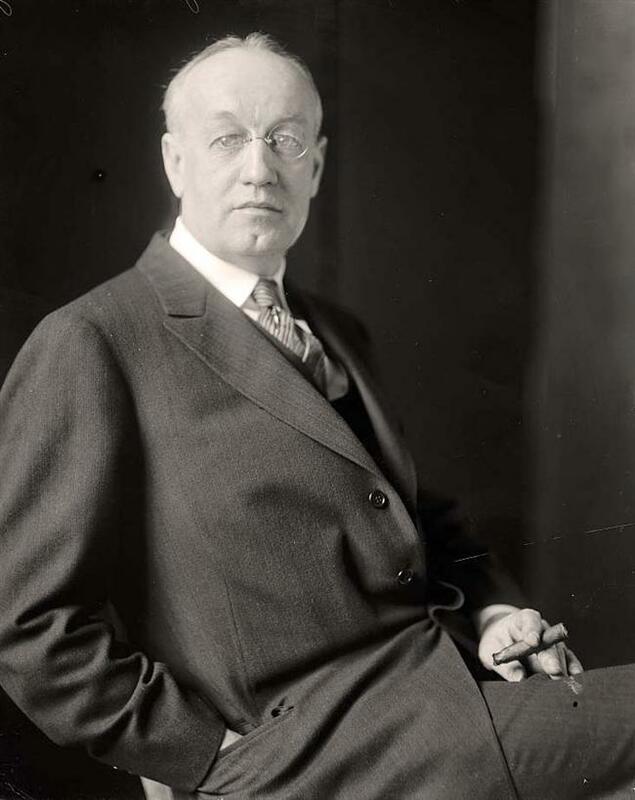 Zink died in 1930 and his will was invalidated, leaving his daughter Margretta Becker as the sole heir to his estate. Ed Durband’s 1932 death placed the operation of the farm into the hands of his son, Ed, Jr. The deepening Depression soon meant that the younger Durband was unable to earn enough from the farm’s operation to pay the annual rent to Margretta and her husband Clarence. The Beckers had no choice but to seek a new tenant. A man named George Schaeffer offered to rent the land which meant that the Durbands were about to be evicted. The Durbands were not alone in the loss of their farm. Between the years 1926 and 1931 one out of every seven Iowa farmers lost their land. Average land values had dropped from its 1920 high of $254 on average to $68 per acre in 1932, placing the majority of farm mortgages underwater. Their mortgages remained high and unadjusted, but it became nearly impossible to operate a farm for a profit. It cost farmers 92-cents to grow a bushel of corn, yet they were only able to sell it for 32-cents. A 49-cent bushel of oats brought in 16-cents at market. The breakeven point for butterfat was 30-cents per pound, yet the selling price was 16-cents. Starting in August 1932, Iowa farmers did exactly what they said they would do: they withheld their agricultural products from market. Roads were blocked, picket lines set up, and a lot of noise was made. It didn’t work. Instead of prices increasing, they dropped even further. Buyers simply purchased their livestock in other markets. By mid-September this phase of their protest had basically ended. Things were quiet for the next few months. Then on January 4, 1933, an estimated 1000 farmers showed up to protest the foreclosure of a farm owned by John A. Johnson. The only bidder for the farm during the proceedings was its mortgage holder – the New York Life Insurance Company – which bid $30,000 for the property. 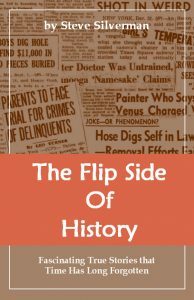 The mortgage had been for $33,000, which meant that Johnson would still have been on the hook for the remaining $3,000. The protesters pleaded with the company’s lawyer Herbert S. Martin to raise his bid, but he claimed that he was not authorized to do so. The crowd grew increasingly angry. As one farmer dangled a noose, shouts were made to “lynch the bloodsucker” and to “hang him on a tree.” Fearing for his life, Martin contacted NY Life and they agreed to pay the additional $3,000. The threat of violence finally grabbed the attention of elected officials. County lawyers declared that they would suspend all foreclosure proceedings until after February 13th. On February 8, the Iowa legislature passed a mortgage moratorium act. Governor Clyde L. Herring went one step further and requested that mortgage and insurance companies postpone their foreclosures. Everything seemed quiet until April 17th. This was the day that the Durbands were to be evicted from the farm now owned by T.M. Zink’s daughter Margretta Becker. Word had spread that Sherriff F.E. Rippey was on his way to carry out the eviction order. Instead, hundreds of farmers gathered at the farm and threatened to “shoot it out” should he carry out the order. For days, the farmers took turns at the Durband farm. While some went home to work on their own farm, others would take their place. Wives brought meals as their husbands made it clear that the Durbands were not leaving. The Durband Family. From the April 29, 1933 publication of the Wisconsin State Journal on page 1. Everything reached a climax on April 27th. A large group of farmers – some reports say as many as 200 – went to the Becker’s home and demanded that they allow the Durbands to remain on their farm. Clarence Becker refused to give in to their demands. Suddenly, a group of men lunged forward and grabbed the judge by his throat and legs and demanded that he not sign additional foreclosure actions. As they issued additional demands, Bradley’s face was punched and slapped, but he refused to make any promises. The mob then dragged the judge through the courtroom, down the hallway, and down the steps outside. They repeated their demands, but the judge once again refused. A group of men then loaded Judge Bradley into a truck and drove out of town as the others followed behind in their vehicles. They stopped when the group reached a crossroads about 1-½ miles (2.4-km) south of Le Mars. The judge was pulled out of the vehicle and once again the crowd made their demands. At this point, the men resumed their physical attack, but the judge refused to give in. Suddenly, someone pulled out a thick rope and noosed it around Judge Bradley’s neck. As the men lifted him up by the rope, the judge suddenly passed out and he was allowed to fall back down to the ground. He came back to about one-minute later and said a prayer for the down-and-out farmers, but still refused to agree to their demands. Calls were once again made to hang the judge and he was dragged to a nearby telephone pole. The rope was thrown up over a sign attached to the pole and the ringleaders began to pull the rope tight. The crowd then began to argue as to whether it was better to hang the judge or to tie him to a car and drive off with his dragging behind. For some unknown reason, the ringleaders hopped back in their truck and sped off. Badly beaten, Judge Bradley stood up and started the long walk back to Le Mars. Farmers offered to give him a ride, but he turned them down. He later accepted a ride from another man who was not witness to the crime. 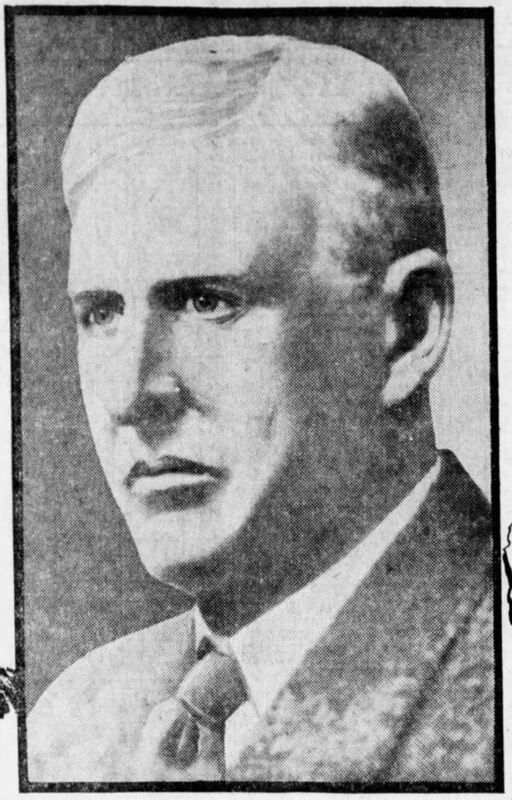 This image of Judge C. C. Bradley appeared in the May 1, 1933 issue of the Des Moines Register on page 10. Le Mars was once again thrown into the national spotlight. The next day Governor Herring issued a statement calling the attack, “a vicious and criminal conspiracy and assault upon a judge while in discharge of his official duties, endangering his life and threatening a complete breakdown of law and order.” He made the decision to declare martial law in Plymouth County, whose county seat is Le Mars. Three national guard companies were called in from nearby Sioux City and a fourth from Sheldon, Iowa. Additional troops responded to violence near Denison, which is located approximately 70-miles (112-km) southeast of Le Mars. Even with a military presence, H.R. Schulz, who was both the co-executor of T.M. Zink estate and co-administrator of the farm from which the Durbands were being evicted, reported that a brick had been thrown through a window of his home. Attached was a note that said, “If the Durband brothers are forced to leave their farm you and Becker will be shot on sight.” A few days later, on May 2nd, the family opted to peacefully vacate the farm. It was reported on May 7th that 125 suspects had been arrested since martial law had been declared. It was also announced that Clarence Darrow – probably best remembered today for his defense in the famed Scopes “Monkey” Trial – would be willing to defend the arrested farmers. On May 10, 1933, twelve days after it he sent the troops in, Governor Herring declared an end to martial law. Clyde L. Herring - Governor of Iowa at the time of the near-hanging of Judge C.C. Bradley. Reports in the press suggest that nearly all of those arrested were released and/or given a small fine for their actions. Seven men were tried for their direct involvement in the attempted lynching of Judge Bradley and received sentences ranging from one to six months in duration. Clarence Darrow, who was seventy-six years of age at the time, did not take part in the defense of any of the men. Ultimately, on August 29, 1933, the court ruled against the Durbands. They were to pay all of the damages in full to the Zink estate. Since the family had no money, their corn crop was used to pay what was owed. Ten days later the Durband family declared bankruptcy. Judge Bradley passed away at his home on July 26, 1939. He was 60-years-old. A May 4, 1933 article in the Carroll Daily Herald was titled “LeMars Residents Begin to Think Zink Estate, With Its Queer Will, Has Operated As Jinx to Locality.” They point to the Zink Womanless Library as the first piece of evidence, the Durband farm uprising as the second, and the story that I will tell you in the next podcast as the third. I’ll keep the subject of that story a mystery for now.